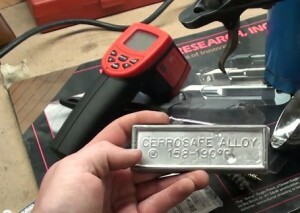 Cerrosafe is an alloy made of bismuth, lead, tin and cardmium. It is a non-eutectic alloy with a yield temperature of 162.5º F.
This alloy melts between 158º and 190º F, considerably lower than the boiling point of water. The alloy contracts during first 30 minutes and after one hour is precisely the size of chamber. At the end of 200 hours, the alloy would swell by just about .0025 ″. This fact is especially considered by toolmakers while making dies or reamers or gauges from casts. One popular use of this substance is in making a cast for gun chamber. It is recommended because of its unique features. As this alloy contracts marginally for a few minutes after solidification, it simplifies removal from long castings. This is quite different from Woodsmetal, which expands after cooling and cannot be removed from a gun chamber. This alloy can be used for a precise bore measurement. One needs to measure dimension only approximately after an hour in order to get the exact measurement. 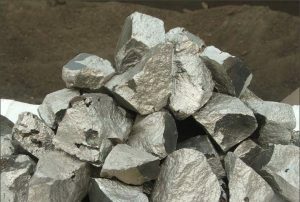 This alloy is suggested to be melted in a neat, iron dipper. Heat sources should be removed once it melts entirely and is ready to be poured. If possible, pour molten cerrosafe through a small tube into the base of the cast, progressively removing the tube as the chamber packs. In case the barrel is cold, it should be warmed to room temperature or above before making the cast. Solidified casting must be detached from the chamber either before or when it cools to room temperature. This is because if left in the container over an hour, cerrosafe mixture would stick to chamber walls and become hard to remove. Next, clean the chamber of the rifle thoroughly. Plug the bore of the throat with a small cloth, but not so firmly that it could not be driven out. Cerrosafe alloy was initially used for toy soldier castings. 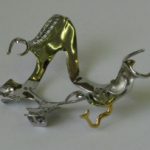 Cerrosafe is also used for casting cavities such as threads, dies and molds. It is used for casting blind holes, duplicate prototypes in foundry match plate patterns and holding work pieces while boring. Cerrosafe is deployed for spray-coating wooden designs, dental lab appliances, electroplating masks. Casts can be repetitively re-melted and reused for other purposes. However, one should be careful to avoid overheating Cerrosafe as it will make it ineligible to use it for recurring purpose.